The rubber sheet of the ball artist Vladimir Samsonov, who helped with his "golden hands" to develop this rubber which is perfectly suited for the aggressive game of the new generation. The soft sponge and extremely elastic rubber layer provides speed and spin and at the same time gives you a lot of feeling due to an optimum of ball control. 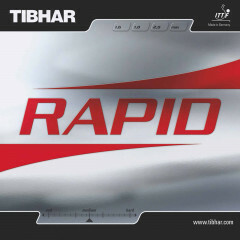 Tibhar Rubber Rapid is beeing added to cart.